This is the second most critical part of your tire carrier as it can dramatically reduce flex and movement within your tire carrier system. This is also the most overlooked part of the build. The latch needs to be able to support the weight of the tire carrier and shouldn’t just be thought of as a convenient spring lock mechanism. Remember, its movement and flex that causes fatigue on the pivot point that results in a tire carrier failure or breakage. 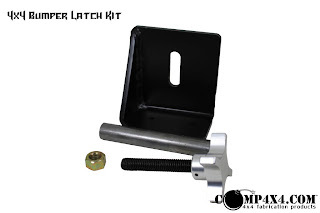 A well-built tire carrier latch kit should reduce any lateral movement as well as forward to back. You should be able to try and shake the tire carrier forcefully by hand without any movement occurring. Consider using a latch kit that not only clamps the tire carrier swing arm down towards the bottom of the bumper but also clamps it back towards the front of the vehicle as well. The most durable tire carrier latch kit designs use a ‘C’ shaped metal backstop for the tire carrier main arm to fit snugly into. This ensures that no up or down movement can take place within the lower swing arm of the tire carrier. Lastly, this design type will use a threaded post/shaft/t-handle design to go directly through the top of the ‘C’ shaped bracket, through the swing arm, and into the bumper. Lastly, you should use a polyurethane pad for the tire carrier main arm to rest on while the carrier is in the fully closed position. No weight should be on the latch while closed, it should all be resting on the urethane pad. This will also reduce bending and stress fatigue on the main pivot point hinge. 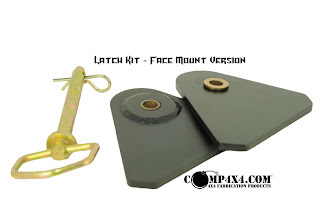 Much like the swing away pivot point of your 4x4 bumper build, you shouldn’t go ‘cheap’ on your tire carrier latch kit. A well-built latch mechanism will complement the tire carrier hinge and provide a long lasting and durable combination. With the reduction of flex, stress, and movement from each of these items you can rest assured that your 4x4 bumper and tire carrier will be able to take any abuse you throw at it. Jared Schoenrock holds an associate of science from Utah Valley University. Jared has been in the 4x4 accessories manufacturing and machining industry for over twelve years. Jared is a master metal fabricator and machinist. He is now the business and operations manager for Competition 4x4.